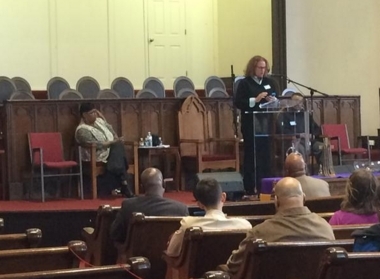 The Interfaith Prison Coalition of New Jersey held its first organizational meeting on Saturday to discuss issues about economic justice in state prisons. NEWARK — A new coalition of activists and former prisoners on Saturday called for greater "economic justice" in New Jersey's prisons. Speaking before an audience of about 50 at Elmwood Presbyterian Church, People's Organization for Progress chair Larry Hamm said the current prison system perpetuates inequality in America. "Jim crow is too kind a term to describe the hell that exists (in prison)," he said. "What we are talking about is a system of modern day slavery." Hamm was one of several speakers at the first organizational meeting of the Interfaith Prison Coalition of New Jersey. The coalition includes former prisoners and activist organizations, which will work together on issues facing inmates in local jails and prisons, said organizer Amos Caley. Among some of the issues the coalition may tackle in the future include heavy surcharges facing prisoners who use the commissary accounts, high telephone rates, and low wages for prison work. Hamm continued to criticize the fact that private companies are making money from an unfair prison system. "Seventy five years ago it was unheard of that a prison could be privately owned," he said. "Seventy five years ago it was unheard of that the juvenile detention center could be privately owned." Gale Muhammad, founder of Women Who Never Give Up, Inc, said families of those incarcerated need more help navigating the prison system. She started her organization after struggling to get her late husband medical care while he was incarcerated, she said. "It is our responsibility to stand up," she said. Earl Amin Jr., 67, who was released from prison in 2013, argued there are huge racial disparities in the prison population. Those with access to more money can reap more benefits in the justice system, he said. "If you are going to do anything about it, you have to start today," he told the crowd.